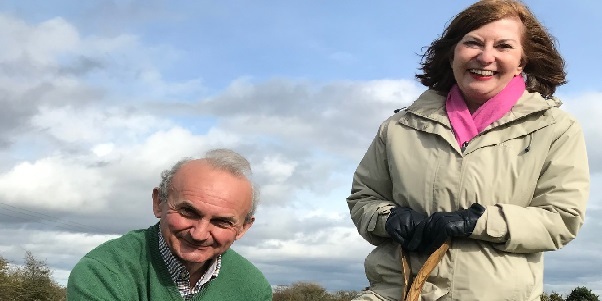 The Forest of Marston Vale recently hosted the planting of 10 trees to celebrate and commemorate the year of public service given by the outgoing High Sheriff of Bedfordshire, Julian Polhill. Joining the celebration were Meryl Dolling, the High Sheriff in nomination and Nick Webb, Chief Executive of the Forest of Marston Vale Trust. The High Sheriff planted the trees on a newly created six-hectare community woodland, between Wixams and the village of Wilstead, to mark the end of his successful and very busy year in post. Meryl Dolling, who will take the declaration as High Sheriff on 30th March, accompanied him. The High Sheriff is the Queen’s representative in Bedfordshire for all matters relating to the judiciary, so they are closely involved with the police, courts and judges within or visiting the county. The Office of High Sheriff dates from Saxon times with the exact date of origin unknown, but certainly for over 1,000 years. It is thought Queen Elizabeth I originated the practice, which continues to this day, of the Sovereign choosing the High Sheriff by pricking a name on the Sheriffs’ Roll with a bodkin. Nick Webb, as Chief Executive of the Forest of Marston Vale, joined them at Wilstead, to plant the trees and said of the occasion, “I’m delighted to welcome both the outgoing and future High Sheriff to this beautiful new woodland, being created in the Forest. I hope these newly planted trees will remind them of their year of public service, for a long time in the future”.